The 19th Tokyo International Book Fair (TIBF) was held this year together with the International Electronic Publishing Expo (EPX), previously less prominent and called the Digital Publishing Fair. It has now become an integral part of the show and occupies the same exhibition space with the physical books. The number of attendees has not yet been announced by the Fair organizers, but the book zone was felts much quieter compared with the hustle and bustle in the digital zone. The TIBF used to be popular because if offered consumers the opportunity to buy books at a discount, typically 20% off the catalog price – this is more important in Japan because of its fixed book prices in bookstores. The decreasing booth space of the publishers in recent years therefore highlights the contracted consumer spending on the books, still mostly in the print format. How about e-books? Do the publishers expect e-books to save the industry from declining sales it has seen over the past 15 years? Not really. The majority of publishers still believe e-books represent a clear and present danger to printed books, bookstores and potentially to the entire publishing ecosystem. So, the large turnout in the EPX comes more and more from non-publishers, including online distributors, digital services, and IT companies. The services companies are focused on the Japanese typesetting, capabilities of the new EPUB 3 and domestic formats (XMDF and dot Book). 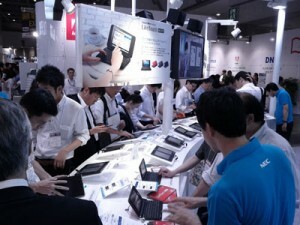 Manufacturers like Sony, Toshiba, Panasonic, and Sharp demonstrated reading tablets mostly based on Android 3. Dedicated e-reading devices were more limited in numbers and varieties.